Soybean is an oilseed crop that represents 49% of the planted area with grains in Brazil, and is one of the most used sources of protein in animal feed intended for poultry, pigs and cattle, with an increase in consumption as human food. Brazil is considered one of the last agricultural frontiers available for expansion of cultivated lands and able to meet the global demand in relation to the population growth. The soybean crop is essential to the production system. It enables crop rotation and direct planting on husks, aids in biological nitrogen fixation and nutrient recycling in the soil. 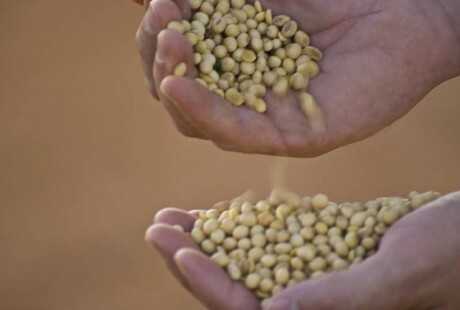 The soybean crop is crucial in the production system in the Cerrado region, not only for profit, but because it allows for the cultivation of a 2nd crop for cotton, corn, sunflower and sorghum. When planning for fertilizers and pesticides, the best cost/benefit for soy production is considered. The choice of cultivars is performed according to the productive potential, cycle, agronomic characteristics and biotechnologies necessary to obtain the best results in each plantation. The research data provides this information for each of our farms. Soybean cultivation promotes a sustainable production environment, mainly by enabling direct planting in husks without soil disturbance, contributing to the soil conservation practices. Planting is done with the use of high-tech machines, during the most appropriate time for each growing region. The use of cultivars adapted to each region reduces the use of pesticides and maximizes productivity. The Integrated Monitoring of Pests and Diseases (MIP/MID) allows to direct efforts and implement the management strategies rationally. The soybean harvest occurs during the months from January to April in the different regions (CO and NE). Within each farm, the harvest should be staggered according to the cycle of each cultivar, which allows for harvesting at optimal ripeness. In the states of MT, MS and MA, early soybean harvest during the months of January and February allows the planting of second harvest crops. Harvesting is carried out by trained operators and machines with high technology and operational efficiency. With the generation of crop maps, we can evaluate the variations within a plantation and act to homogenize the area and increase the average productivity. The processing and storage of soybeans begins with receiving it in the warehouse, with subsequent pre-cleaning of the grain, followed by drying and storage. The final destination is the shipment of the stored grain to the end customer. For the soy products like soy meal and cooking oil to reach you, many steps need to be taken. Within the gates of the farms planning, planting, cultivation and harvesting should take place. There is also the receiving, processing and storage of the grains. Outside the gates, there is the transport of the grains to ports or milling agribusinesses. From agricultural planning to delivery of the product to agribusinesses, it can be up to an 18 month cycle. 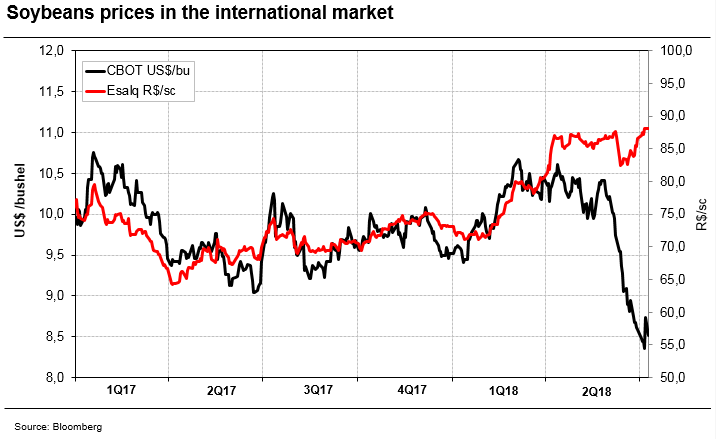 Soybean prices for the spot contract on the Chicago Board of Trade during 2018 already have gained 8%, after reaching a peak of 12% on March 5, when prices closed at 10.66 USD/bu. The production and consumption of soy almost doubled since the beginning of the 2000s.For the 2017/18 crop year, after confirmation of the crop shortfall in Argentina, the global supply-demand balance points to production lagging consumption, pressuring world stocks. According to data from CONAB, Brazil should end the 2017/18 cycle with record-high soybean production of around 115 million tons. Some market analysts expect the country to export around 73 million tons of soybean, or around 7% more than last crop year. In the United States, for the 2018/19 crop year, the USDA, through its first report of planting intentions for 2018, projected a reduction in soybean planted area, bucking the rest of the market, which estimated expansion of around 2%. Harvest was concluded on the 230,127 hectares in the current crop year dedicated for this crop, where we registered a record yield of 3,756 kg/ha, which is 11.8% more than initially projected.